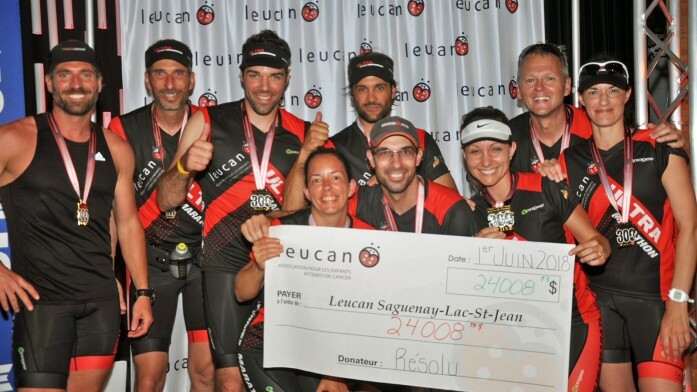 A group of nine passionate Resolute employees from across Quebec participated in the annual Ultramarathon benefiting the Saguenay–Lac-Saint-Jean chapter of Leucan, an organization that funds clinical research and provides resources to young cancer patients and their families. The fundraiser also benefits the Fondation École secondaire de l’Odyssée Lafontaine Dominique-Racine, which supports students in need from a local high school. The race began in Chicoutimi in the early morning of May 31, and took participants all over the picturesque Saguenay–Lac-Saint-Jean region. Hundreds of people took to the streets to encourage family and friends, who ran despite the intense heat and humidity. Participants ran in relays for a total of 32 hours, and the crowd cheered as they crossed the finish line. Following the marathon, a celebration was held to highlight the $196,000 raised, an impressive achievement. Team Resolute raised $24,000, far exceeding its $10,000 goal. This is the third year that employees from Resolute have participated in the marathon, and raised the most money. “Participating in the Leucan Ultramarathon provides Resolute with an opportunity to give back to the community and to support some of its most vulnerable members,” said Michael Plourde, who is responsible for logistics in Resolute’s Wood Products segment and served as co-captain of Team Resolute. “We are extremely proud to be associated with this extraordinary event,” added Julie Gauthier, who manages purchasing for several Resolute sawmills and also served as co-captain for Team Resolute. Thank you to our Resolute team, and well done to all participants!